Lying on the southern coast of Mainland China, Hong Kong is geographically closely linked to Guangdong Province. Blessed with a mild climate and ample rainfall, Hong Kong is rich in flora and fauna. Although some 10,000 times smaller than China, Hong Kong has an impressive butterfly checklist of about 240 species (Lo & Hui, 2004), representing about 11 percent of the 2,153 species recorded throughout China (壽 等, 2006). This is a surprisingly high number as compared with 85 in Macau (Easton and Pun, 1999), or about 400 in Taiwan where it is far larger (台 灣 蝴 蝶 保 育 學 會, 2009). Historic records show that Hong Kong has an accumulation of 292 butterfly species. Among them, 53 are considered occasional vagrant, doubtful species or having no recent records. After removing these 53 species, the current butterfly checklist in Hong Kong has 239 species. Although there is no endemic species, there is one endemic subspecies (Halpe paupera walthewi). Besides having cultural and ornamental value, butterflies also play important and unique roles in ecology, science and the economy. The most widely known is the close correlation between butterflies and plants. At least 6 flora species in Hong Kong depend on butterflies to disperse pollen: Splash-of-white (Mussaenda pubescens), Hong Kong Pavetta (Pavetta hongkongensis), Glabrous Pittosporum (Pittosporum glabratum), Acronychia (Acronychia pedunculata), Long-flowered Ehretia (Ehretia longiflora) and Reevesia (Reevesia thyrsoidea) (Corlett, 2001). To scientists, butterflies are great study and research subjects, ones that lead to many other interesting investigations. In China, butterfly caterpillars are used in pharmaceutical applications. The caterpillar of Swallowtail (Papilio machaon), a vagrant that visited Hong Kong in 2004, is a Chinese medicine for stomach disorder. Indeed, butterflies bring great benefits to both nature and man. They are important insects of significant value. Before naming a species of conservation concern, one must identify, record and understand accurate information on its life cycle. Some of the rare butterflies feed on certain rare plants and have strikingly coloured patterns. These butterflies should be protected. The following are five such species. Birdwings: Uncommon species Common Birdwing (Troides helena) and rare species Golden Birdwing (T. aeacus) are the largest butterflies in Hong Kong. Their wingspan can be as wide as 16 cm, and Common Birdwing (T. helena) is usually larger than Golden Birdwing (T. aeacus). 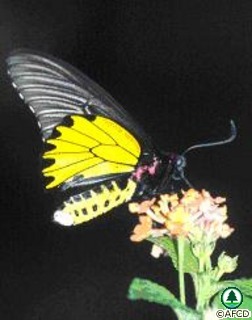 Both species are listed as butterflies of local conservation concern by Fellowes et al (2002). They share similar habits and occur in areas where India Birthwort (Aristolochia tagala) grows. Adults often sip nectar from the flowers, and males display significant territorial behaviour. The Indian Birthwort is a climbing vine found in shrublands. It is the food plant of Birdwing larvae. Attracted by its special scent, female Birdwings lay eggs on its stems and leaves. When hatched, the caterpillars feed on new shoots, buds and leaves. After maturing, caterpillars usually pupate and hang their chrysalises on the stem of Indian Birthwort. In fact, Birdwings spend a good part of their life on Indian Birthwort. Both species have been recorded in Po Lo Che, Fung Yuen Valley , Tai Po Kau, Ngong Ping, Tai Lam Wu, Tai Tam Country Park and Shing Mun Country Park. 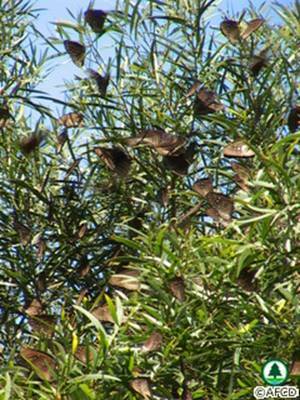 Records show that Common Birdwings are more widely distributed than Golden Birdwings. The former can also be found in Shan Liu, Ho Chung and Wong Lung Hang. Common Rose: Pachliopta aristolochiae is a Swallowtail (family Papilionidae) found mainly in well-vegetated valleys. It was common in the 1960's but it is now considered rare. It appears sporadically. In years of abundance, it can be found in relatively large numbers at sites with its larval food plants, but it may be completely absent in other years. Key sites include Po Lo Che, Fung Yuen Valley, Tai Po Kau, Ngong Ping, Shing Mun Country Park, Shan Liu and the Peak. The larvae feed on Indian Birthwort (Aristolochia tagala) and Ford's Birthwort (A. fordiana). White Dragontail: Lamproptera curius is the smallest Swallowtail in Hong Kong. It is considered rare in Hong Kong. Its characteristic dragonfly-like flying pattern, transparent wing parts and tailed hind wings distinguish it from other butterflies. Its larval food plant Illigera (Illigera celebica) is protected under the Forestry Regulations of the Forests and Countryside Ordinance (Cap. 96). White Dragontail has been recorded in Po Lo Che, Fung Yuen Valley, Tai Po Kau, Shing Mun Country Park, Yung Shue O, Kak Hang Tun and Kap Lung. Red Lacewing: Cethosia biblis is a locally uncommon species whose larvae feed on Passiflora moluccana, a vine of restricted distribution. This species used to have a wider distribution. During the 1960-70's, it was widely present in the New Territories and was recorded in Stanley on Hong Kong Island (Marsh, 1960). Recent records were made in Lung Kwu Tan, Lung Kwu Chau, Pui O and Shing Mun Country Park. Successful conservation begins with educating our younger generation. Only by communicating knowledge and appreciation of butterflies can we succeed with a long-term conservation programme. While actively promoting nature education, the Agriculture, Fisheries and Conservation Department (AFCD) has established a complete, systematic butterfly database from our baseline surveys. This data makes an important base for future monitoring and conservation programmes. 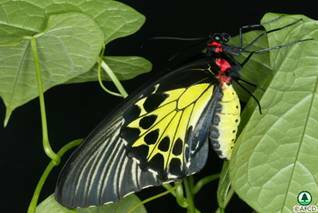 Common Birdwing is protected under the Wild Animals Protection Ordinance (Cap. 170) and all Birdwings (Troides spp.) are listed under Schedule 1 of the Protection of Endangered Species of Animals and Plants Ordinance (Cap. 586) that regulates the trade and possession of these butterflies. In addition, Indian Birthwort and Illigera are protected under the Forestry Regulations of the Forests and Countryside Ordinance (Cap. 96). No person shall, without lawful excuse, sell or have in his possession of these plants. About 80% of Hong Kong's territory is still natural, or semi-natural. Nearly half of this, 40% is designated as Country Parks and Special Areas, where plants and animals within are protected by law and managed by AFCD. Butterfly Working Group (2011) identified 51 butterfly species of conservation concern. We assessed the effectiveness of Hong Kong 's protected area system in protecting these 51 species based on the existing butterfly distribution information. It was found that 49 of the 51 species have at least one locality inside the Hong Kong protected area system. Only two species, Catochrysops panormus (Silver Forget-me-not) and Euploea sylvester (Double-branded Black Crow), which accounts for less than one percent of the total of butterfly species recorded in Hong Kong, is not represented in our protected areas. This clearly demonstrates the importance of protected areas for in-situ conservation of butterflies in Hong Kong. In late 2004, in collaboration with conservation organizations such as Hong Kong Lepidopterists' Society, WWF HK, Kadoorie Farm & Botanic Garden and Green Power, AFCD selected various sites in Hong Kong as key conservation sites for butterflies, and thus assisted in mapping out our future butterfly conservation work. Wu Kau Tang and Lai Chi Wo: Partly within the Plover Cove Country Park, these two sites and the areas between them cover a variety of different habitats including woodlands, scrublands, abandoned agricultural fields and coastal areas. Some uncommon Lycaenidae and rare Hesperiidae, such as Club Silverline (Spindasis syama) and Great Swift (Pelopidas assamensis), can often be seen. In addition, Yellow Coster (Acraea issoria), which is new to Hong Kong, was recently sighted in an abandoned agricultural field here. During the 2002-2011 survey, AFCD recorded nearly half of all local butterfly species in this area. Tai Po Kau Nature Reserve: During the 2002-2011 survey, AFCD recorded 112 species in the reserve. Some uncommon and very rare butterflies, like White Commodore (Parasarpa dudu), Constable (Dichorragia nesimachus), Painted Jezebel (Delias hyparete) and Orange Oakleaf (Kallima inachus) can be found here. Chocolate Mime (Chilasa agestor), another new species recorded in Hong Kong in 2002, was discovered at this site. In Butterflies of Tai Po Kau Nature Reserve, Young and Lee (2001) listed more than half of all butterflies occurring in Hong Kong. 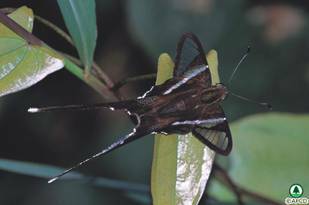 Pak Tam Chung: Within the Sai Kung East Country Park, Pak Tam Chung is a well-vegetated area with high butterfly diversity. During the 2002-2011 survey, AFCD recorded 107 species in this site. These included White-banded Flat (Gerosis phisara), Tailed Sulphur (Dercas verhuelli), Gaudy Baron (Euthalia lubentina) and Muirhead's Labyrinth (Neope muirheadii). Fung Yuen Valley: Designated as a Site of Special Scientific Interest (SSSI) in 1980, Fung Yuen Valley is a forested ravine behind the village of Fung Yuen. This SSSI is recognized as an important breeding site for some butterflies of conservation concern, such as Common Birdwing and White Dragontail. Despite being located at the urban fringe, remarkably more than half of all local butterfly species have been recorded here (Young & Yiu, 2002). Lung Kwu Tan: The fung shui wood and adjoining scrubland on the hillside in the vicinity of the Lung Kwu Tan Village are renowned for its diverse butterfly assemblages. The site is also recognised as an important breeding site of the locally uncommon Red Lacewing. Other uncommon butterflies found here include Striped Blue Crow (Euploea mulciber) and Danaid Egg-fly (Hypolimnas misippus). During the 2002-2011 survey, AFCD recorded 117 species here. The Peak: The Peak is one of the last green havens on the heavily built-up Hong Kong Island, with relatively well preserved vegetation. In the area between Lugard Road and Harlech Road, butterflies are common. 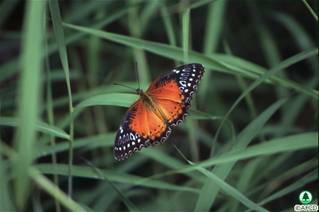 During the 2002-2011 survey, AFCD recorded 64 species in the Peak area, including the uncommon Red Lacewing (Cethosia biblis), Dark Edged Snow Flat (Tagiades menaka) and very rare Chinese Windmill (Byasa alcinous). Siu Lang Shui: Siu Lang Shui is a closed landfill where public access is restricted. Although the site has been planted almost entirely with exotic trees species, such as Eucalyptus spp. and Acacia confusa, it is an important overwintering site for Crows and Tigers (sub-family Danainae), mainly Common Indian Crow (Euploea core) and Blue-spotted Crow (E. midamus), and a small number of the uncommon Striped Blue Crow (Euploea mulciber) and Dark Blue Tiger (Tirumala septentrionis). Scientific research carried out by AFCD indicates approximately 32,000 - 45,000 individuals spent the 2002 - 2003 winter in Siu Lang Shui. There are 5 families of butterflies in Hong Kong, each different in shape, colour, flight pattern and other characteristics. Beginners can identify individual species by noting these features. Illustrated butterfly guides and reference information are helpful tools for learning special features and ecological characteristics. To accurately identify smaller species, such as Hesperiidae and Lycaenidae, or to distinguish similar species, you need field observation experience. The more you watch butterflies in the wild, the better you will get. Butterflies become inactive when the temperature drops below 22°C. With an average temperature of 22.8°C, Hong Kong has butterflies occurring all year round. Abundance and diversity are most marked in spring and summer between April and June, and in autumn between October and November. On particularly cold or hot days, butterfly numbers decrease drastically. Species that go through one generation of life cycle a year occur only in certain months. If you miss them, you would have to wait till next year. Butterflies are cold-blooded animals. You often see them sun bathing themselves where there is ample sunlight. This is a good time to observe them closely, as they remain relatively still. On cloudy days their numbers drop and on days of heavy rain you would not find any butterflies at all. When the sun comes out after rain, it is one of the best times to watch them in motion. On warm days in spring and summer, the best hours to watch butterflies are 9:00-11:00 am and 2:00-4:00 pm. In autumn and winter, the best hours are 10:00-11:00 am and 2:00-3:00 pm. Although most butterflies are active during the day, some Hesperiidae and Satyridae are most active at dusk. 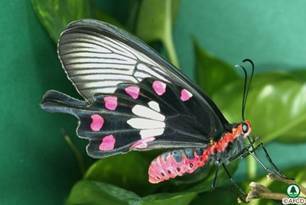 Diverse habitats and flora provide butterflies with diverse roosting, feeding and mating environments. Common species like to visit flowering plants in the open countryside. Abandoned agricultural fields, fruit orchards, fung shui woods and most Country Parks are all ideal butterfly watching spots. In the uplands, you can find uncommon and rare species congregating at summits where they mate. Remote islands are also good places to watch rare butterflies They usually avoid windy and permanently shaded areas. Illustrated butterfly guide, notebook, pen, camera and binoculars. Respect life. Do not capture any butterflies in the wild. Bascombe. M.J., G. Johnston and F.S. Bascombe. 1999. The Butterflies of Hong Kong. Academic Press, London. Butterfly Working Group, 2003. Migration and overwintering aggregation of Danaid butterflies in Hong Kong. Hong Kong Biodiversity 6: 1-7. Butterfly Working Group, 2011. A review on the local restrictedness of Hong Kong Butterflies. Hong Kong Biodiversity 21: 1-6. Butterfly Working Group, 2018. Note on the current status of Euthalia niepelti, Lethe chandica and Notocrypta paralysos. Hong Kong Biodiversity 25: 17:18. Chou, I., 1994. Monographia Rhopalocerorum Sinensium. Henan Science and Technology Press, Henan. Corlette R.T. 2001. Pollination in a degraded tropical landscape: a Hong Kong case study. Journal of Tropical Ecology 17: 155-161. Easton, E.R., and Pun, W.W., 1999. Butterflies in Macau. University of Macau, Publications Center, Macau. Hong Kong Lepidopterists' Society, 2002. Index to Butterfly Families recorded from Hong Kong. Lee, Z.Y., Wang, X.Z, 2002. Butterflies in Taiwan. Owl Publishing House, Taibei. Lau, P., 1997. Butterflies of Hong Kong. Paul Lau Photography, Hong Kong . Lo, Y.F., Hui, W.L., 2004. Hong Kong Butterflies. Agriculture, Fisheries and Conservation Department. Marsh, J.C.S., 1960. Hong Kong Butterflies. The Shell Company of Hong Kong Ltd, Hong Kong. Young, J.J., 2001. Record Euploeas hibernating at Siu Ling Shui, Tuen Mun. Young, Y.S., Li P.C., 2001. Butterflies of Tai Po Kau Nature Reserve. Agriculture, Fisheries and Conservation Department. Young, J.J., Yiu, Y., 2002. Butterflies Watching in Hong Kong. Wan Li Book Co. Ltd., Hong Kong.